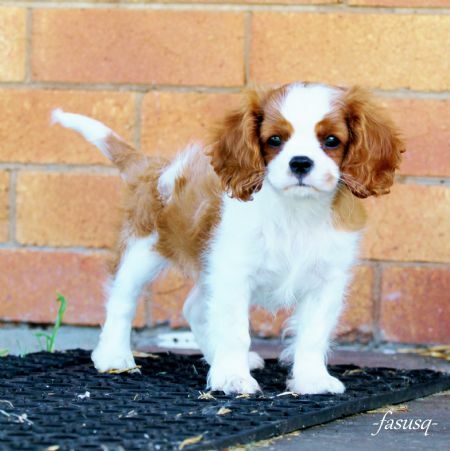 We are currently waiting for Aria to come in season, she is being mated to a lovely Blenheim boy interstate. This will be her 2nd and probably last litter. Gloria is due in season March 2019. She is being mated to a handsome young tri-colour boy interstate. Even though I don't have any puppies available at the moment, feel free to contact me as I more than likely know of someone who does. Press Play on the photo to see a slideshow of typical Fasusq puppies! We don't have litters very often, so when we do its for ourselves to keep a puppy as the next generation of "Fasusq" first and foremost. Puppies that aren't kept by us are available as pets to suitable homes. Our puppies grow up in our house including the bedroom, lounge room, kitchen & bathroom. So that they can "acclimatise" to household noises. By the time that the new "parents" pick up their puppy, they would have been wormed fortnightly, vaccinated and vet checked.